Activities for imaginative playtime - every day of the year!With 365 Toddler Activities That Inspire Creativity, you can spark your child's creativity and maximize his or her potential every day of the year. Written by an experienced child-care expert, you will find hundreds of entertaining toddler activities, songs, games, and art projects that stimulate cognitive development and encourage inventiveness. You and your toddler will enjoy playtime with age-appropriate activities like:Magic Sun PrintsTreasure ChestSprout in a BagRainbow ToastFishing in the TubAll-About-Me BookAnd so many more! 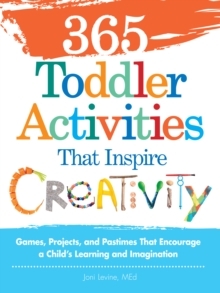 Featuring everything from outdoor activities to rainy-day fun, 365 Toddler Activities That Inspire Creativity provides hours of creative toddler play!